THE EMOTIONS were running at super-sonic speeds when we boarded the bus for Kullu. Our mountain bikes were well-serviced and packed in big cartons that were easy to lift and transport. The bus kicked off on time, and the inertia of being in Delhi soon faded. The following morning we reached our destination – a beautiful abode in a small settlement called Naggar. Our bicycles were unpacked and we went on a small test drive to nearby apple orchards in the evening. Every one of us in the Dare 2 Gear team – the adventure travel company that had organised the entire trip – slept early in anticipation of the next day’s gruelling journey. 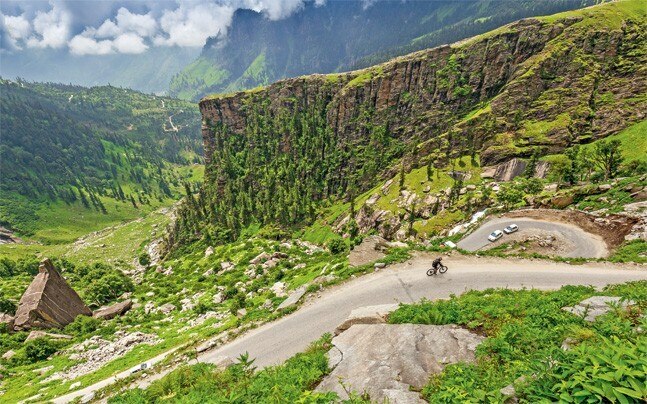 The itinerary for the first day of our expedition was to cover Rohtang Pass and reach Sissu. We rested our tired bones in Sissu, at Hotel Triveni, for the night and left for Patseo in the morning. We crossed a beautiful stretch of land called Jispa, which was dappled with streams and lush green sceneries. The most thrilling part of the ride was when we took our shoes off, tied them to the bikes, and crossed small rivulets with the cycles over our shoulders. We reached Patseo on schedule, where cozy tents had been prepared for our stay. The simple dinner of dal, rajma chawal and eggs seemed like heaven. The following morning, we were prepared for the day’s destination i.e. Sarchu, locally known as ‘Sir Bhum Chum’. The ride was a tough one and most of my journey was spent riding in the support vehicle. The low oxygen levels took a heavy toll on my body. We crossed Zing Zing Bar, Suraj Tal and Bara-lacha-la pass and stopped for lunch at Bharatpur. Suraj Tal, meaning the Lake of the Sun God, lies just below the Bara-lacha-la pass. The lake is crystal blue in colour – it continuously gathers icy cold water from surrounding melting glaciers. Bharatpur offers tented accommodation for a night’s stay. The tents are warm and cozy despite the high winds outside. The night went by peacefully and we left early in the morning for our next destination – Pang. The ride was a fun-filled one as we conquered 21 hair-pin bends, also famously known as Gata Loops. (I was only able to complete 19, which is a pretty decent score.) The rest of the day’s journey included crossing Nakeela Pass and Lachung La pass. After a stay at a dormitory named Sonam Pangri Motel in Pang, it was time to cover the beautiful 45km stretch on More Plains. The beauty of More Plains cannot be described in words. As the plains ended, the weather turned chilly and the rain forbid us from riding on. Next, we crossed the second highest motorable road in the world – Tanglang la Pass. On the way to Lato, we stopped at Rumste for some snacks. The next day we were ready for the final lap of our expedition. We planned to reach Leh by the afternoon. We started on time and the weather was bright with the sun pouring its blessings on us. We pulled in slowly and stopped at Thickse Monastery for a visit. The next day I decided to visit a few places around the city all by myself. Breakfast at Bon Apetit was a treat, and I started my day with loads of enthusiasm. I visited the Royal Leh Palace, which is near to the Main Bazaar. The palace overlooks the whole city and stands guard to any calamity. The bazaar below offers a variety of food outlets/kiosks and shopping stalls. We also paid a visit to Gurudwara Pathar Sahib, nearly 25 miles from Leh city and spent a good amount of our evening there slurping and chatting over hot tea. It was very snug to stay there, and blankly stare at the abstract silence that blanketed the place. An evening visit to the gurudwara is highly recommended. It has been a month since the expedition. Sometimes when I close my eyes and try to remember the journey, I am overjoyed to think of all that I encountered and, eventually, conquered. – While going downhill, do so gently and apply both brakes or there are chances of falling on face or skidding. – While going uphill, the combination of gears is very important. Using a combination of 1, 2-3 & 2, 1 is suggested. Only over very steep terrain do we use 1, 1 combination. – There should be sufficient brake oil all the time and it should be checked regularly (in a hydraulics bicycle). – While riding on an uneven terrain, do not sit on the saddle as you might hurt yourself. – Drink sufficient water at regular intervals so that your body is hydrated. – Keep a piece of raw garlic in the mouth in order to avoid acute mountain sickness. 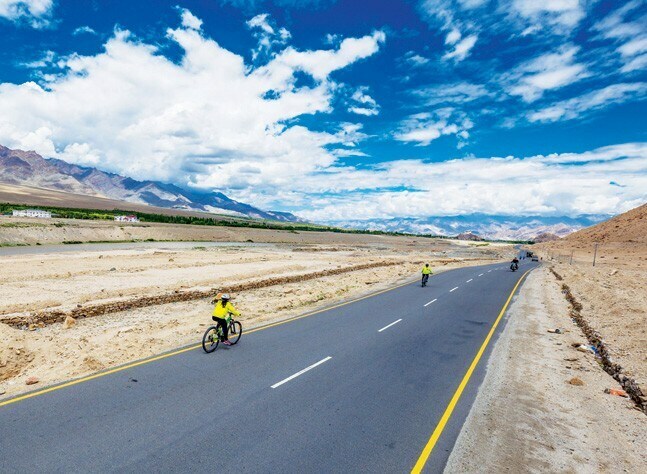 This is specific to Manali-Leh cycling. – One must have a basic idea of fixing punctures, seat saddles and tyre.